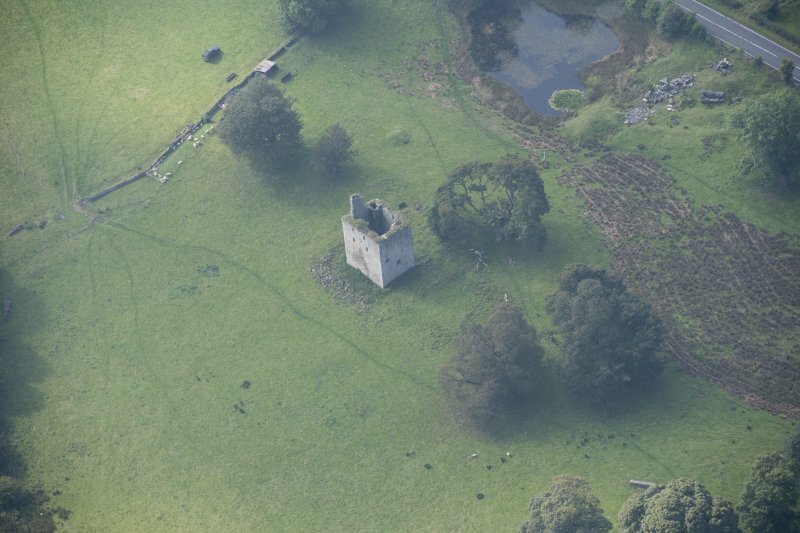 Oblique aerial view of Barr Castle, looking SSE. 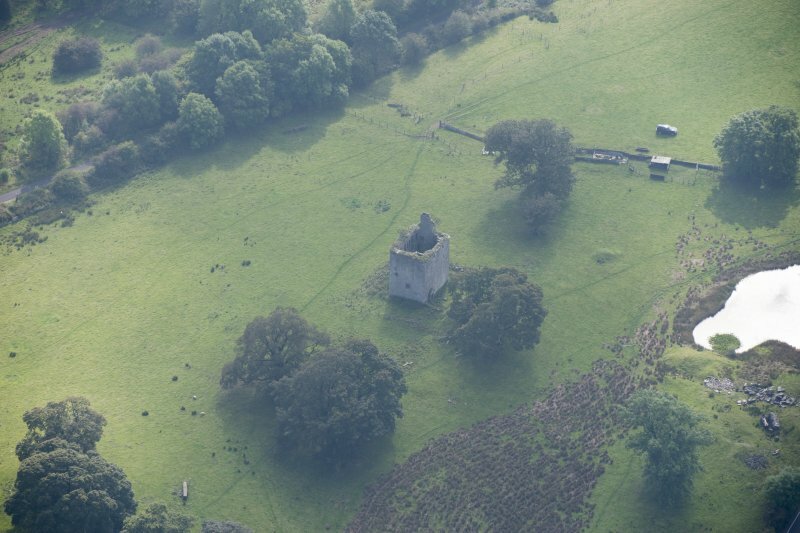 Oblique aerial view of Barr Castle, looking SW.
Oblique aerial view of Barr Castle, looking NW. 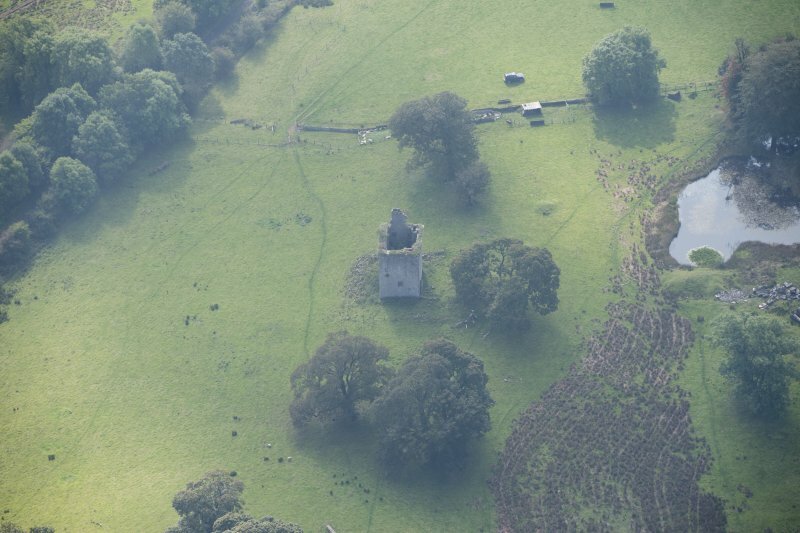 Oblique aerial view of Barr Castle, looking E.
Oblique aerial view of Barr Castle, looking SE. 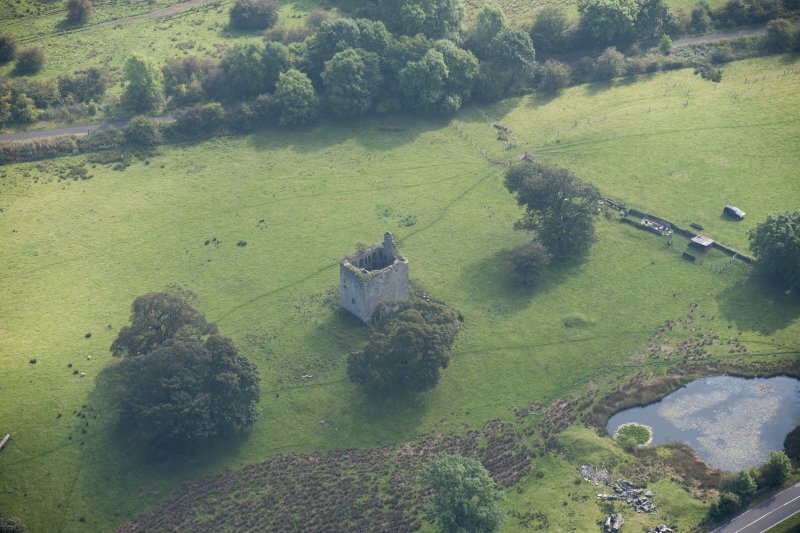 Oblique aerial view of Barr Castle, looking NNW. 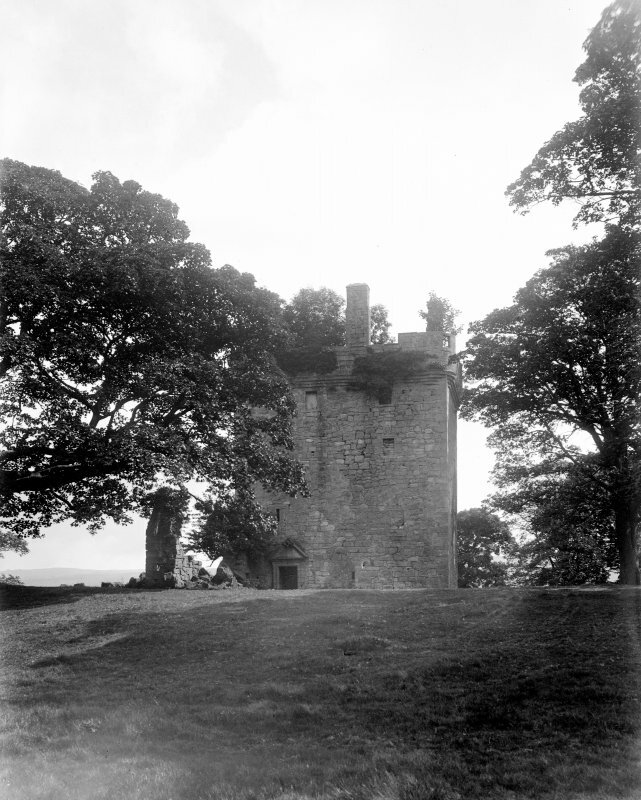 General view of Barra Castle. 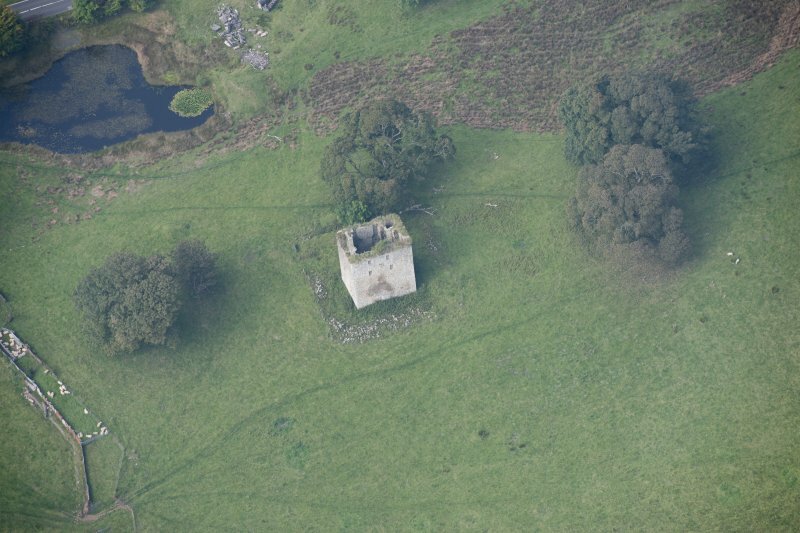 Oblique aerial view of Barr Castle, looking ESE. 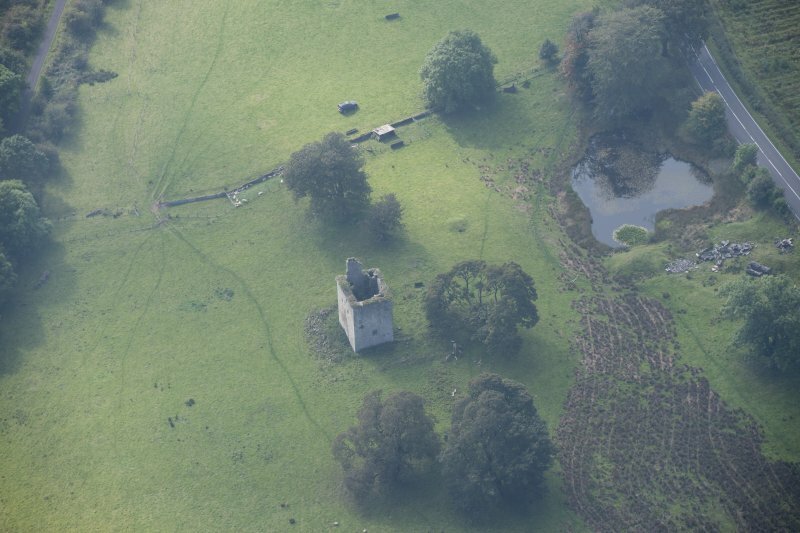 Oblique aerial view of Barr Castle, looking S.
Oblique aerial view of Barr Castle, looking WSW. 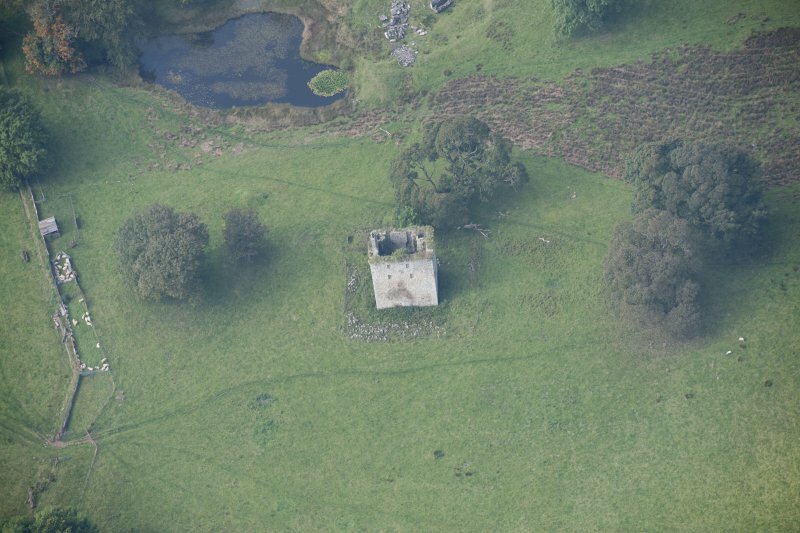 Oblique aerial view of Barr Castle, looking W.
National Art Survey - 1 sheet. 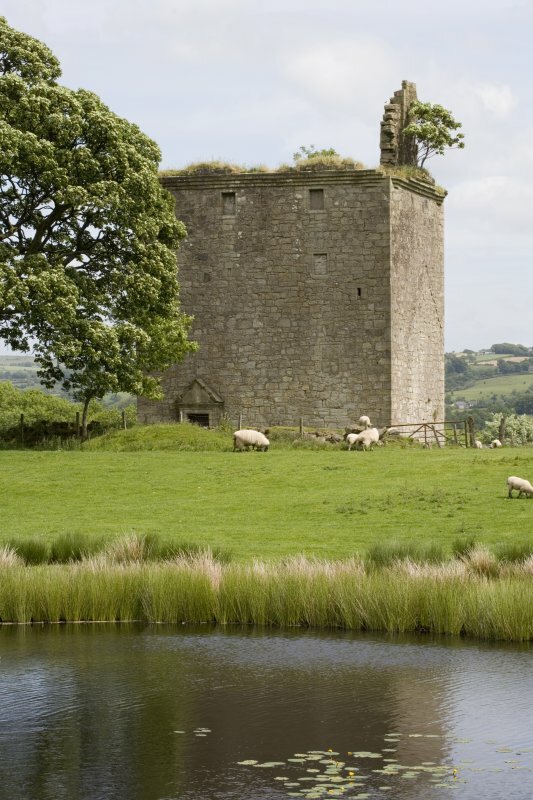 Barr Castle, built in the early 16th century, is a simple rectangle on plan, measuring about 35 1/2ft E-W by 26ft transversely and rises to four storeys beneath the parapet with a garret above. 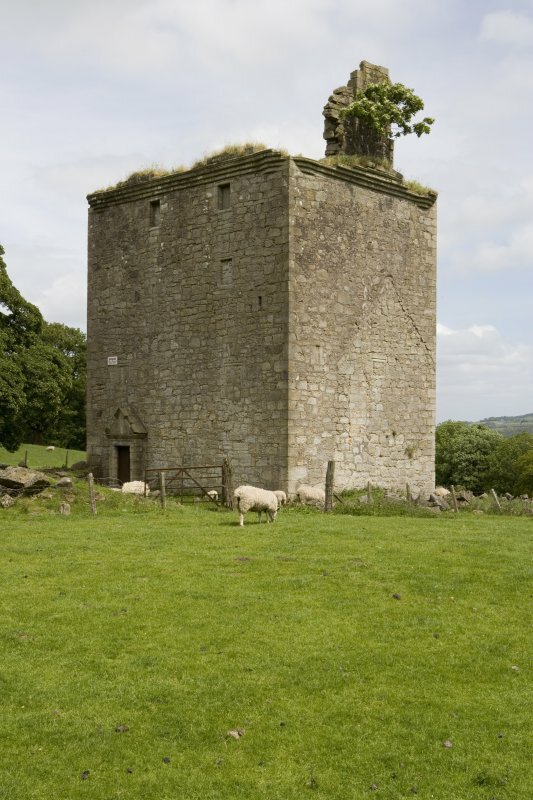 There was a wing on the S side of this keep; it was extant until the 19th century. 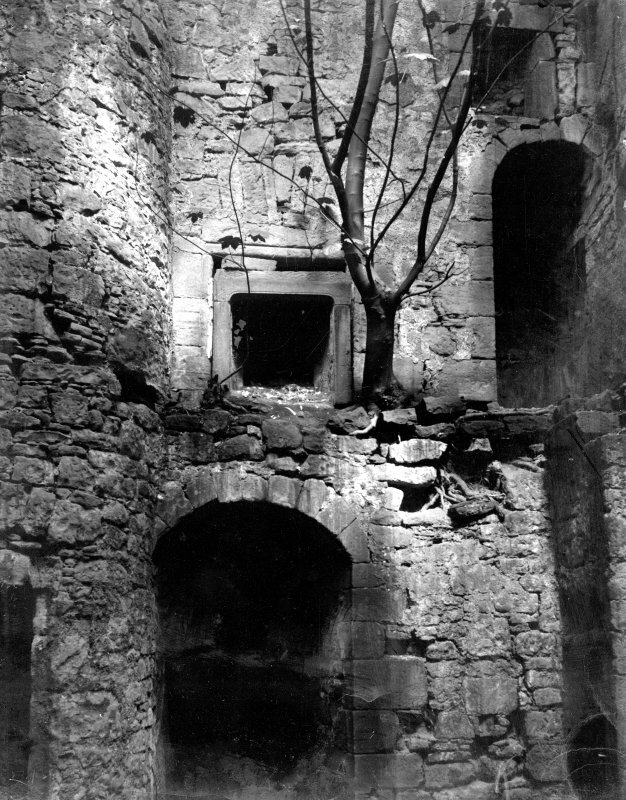 There was also a courtyard on the W of the keep (see plan and illustration) but hardly any trace of it now survives. 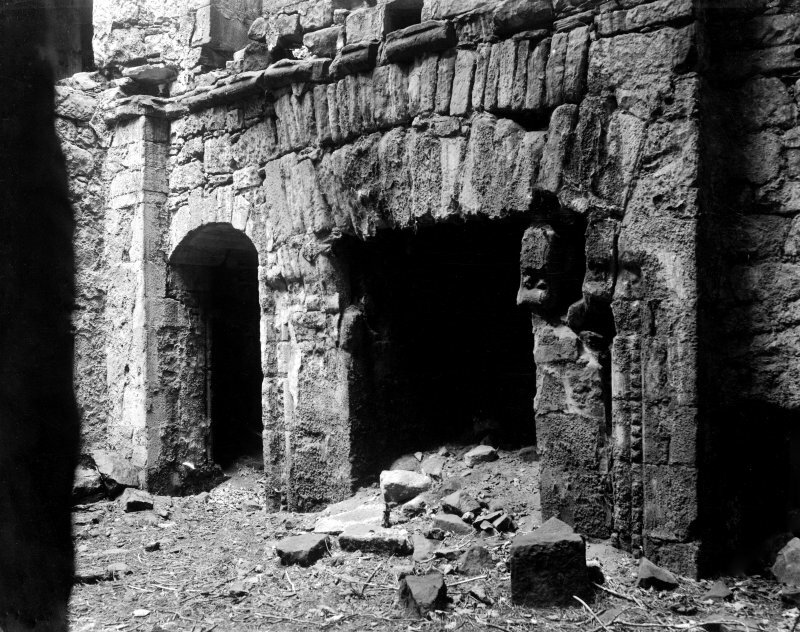 The walls of coursed rubble, contain gunloops and arrow slits. 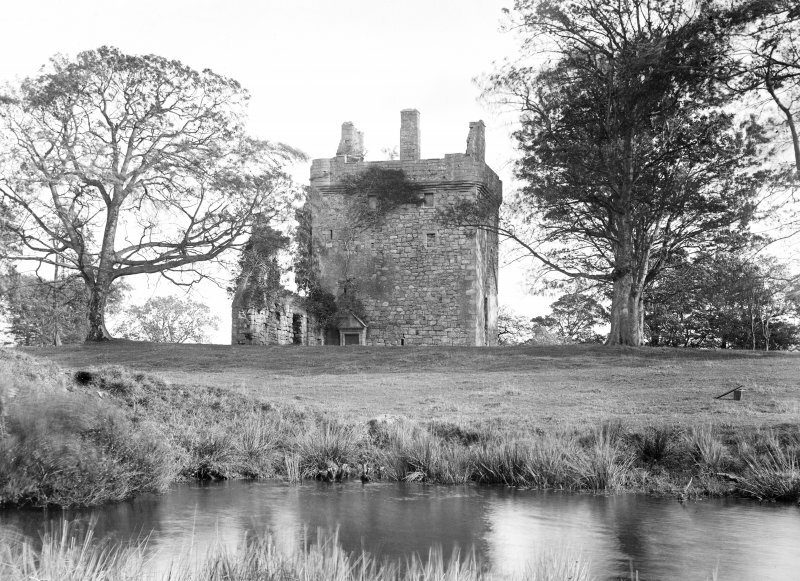 A lintel at the foot of the stair is inscribed L H I C 1680, while on the battlements are W O 1699. D MacGibbon and T Ross 1889; N Tranter 1965. 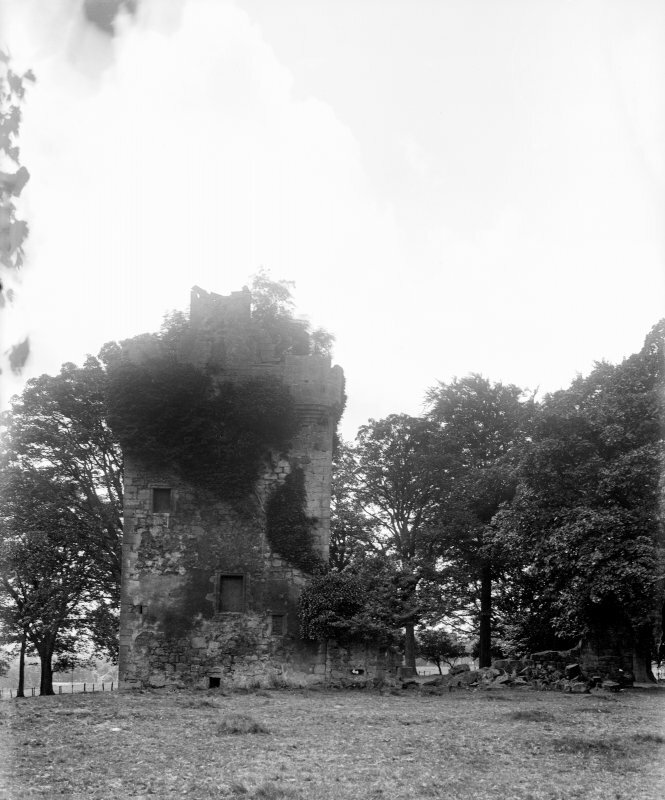 The ruins seem to indicate two phases of building. 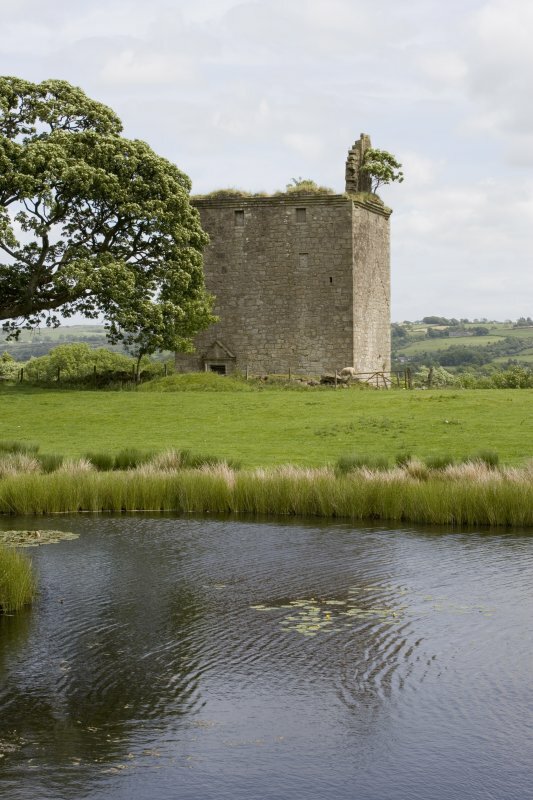 The first is marked by the tower, 7.8m E-W and 10.7m N-S, which stands to the level of the corbelling of the four angle turrets, now gone, about 12.0m high. 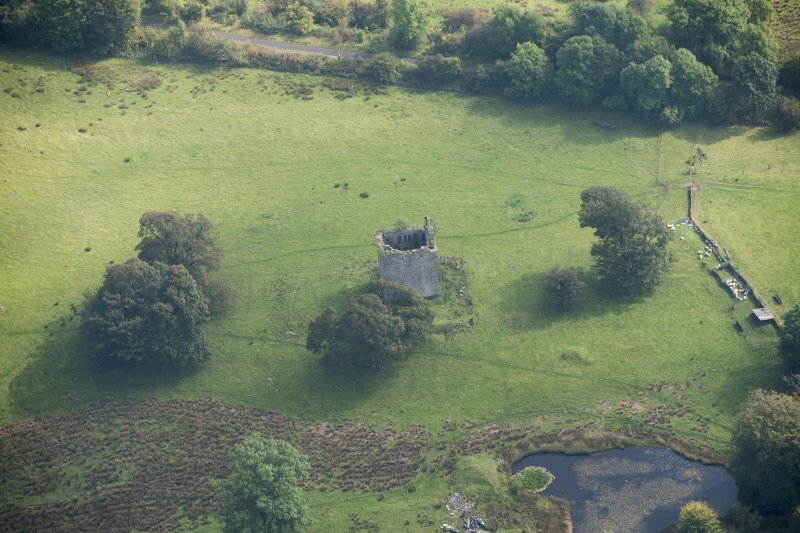 The ground storey consists of two vaults, the first storey a hall, and the others now too ruinous to identify. 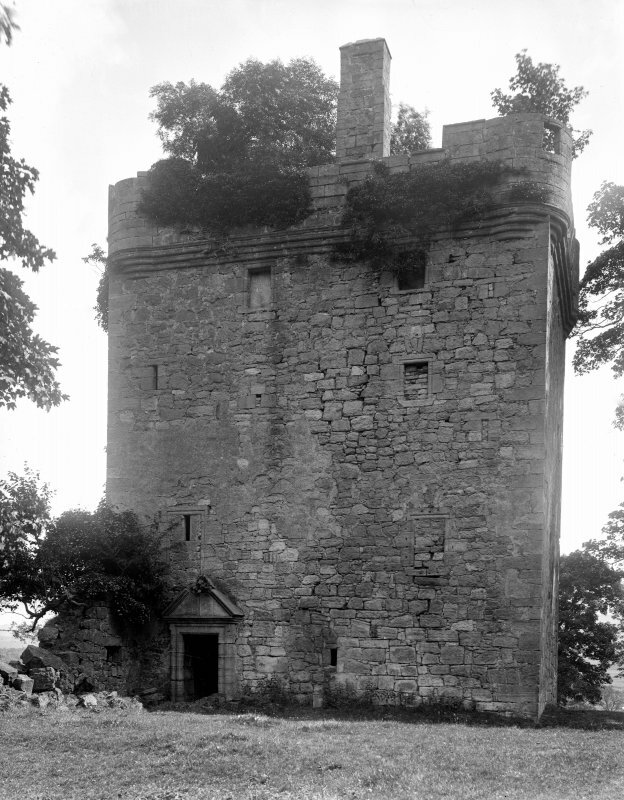 The tower has walls of roughly-coursed, square-faced masonry with dressed stone corner-quoins, and was pierced by small slits (now blocked) and round-headed openings. 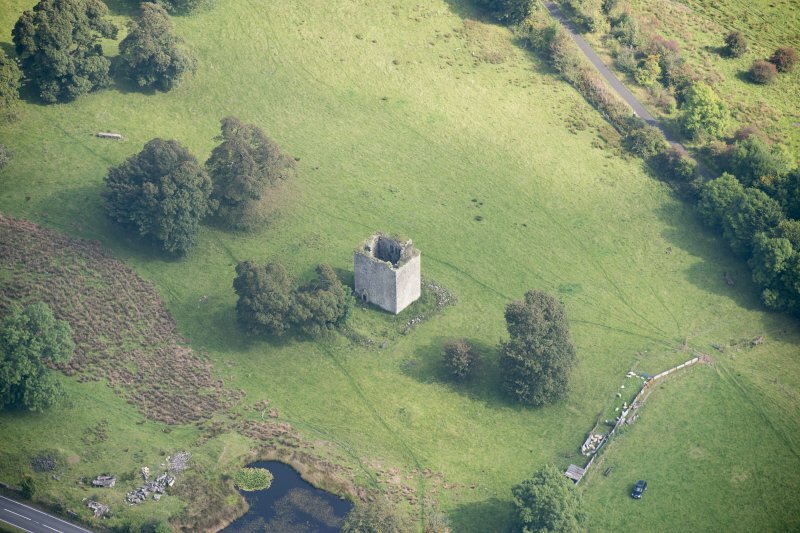 Contemporary with the tower was probably the 'bailey', a rectangular piece of raised ground N of the tower. 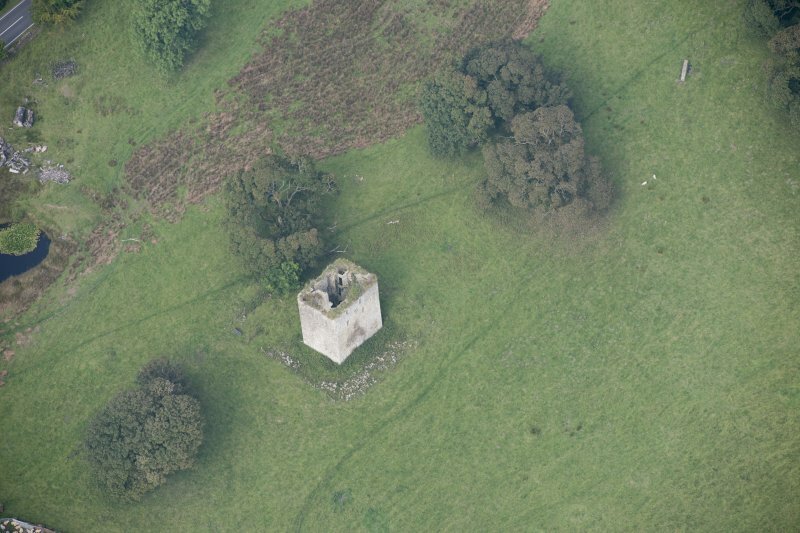 No trace of any enclosing walling can be seen except for a large stone-possibly a gate pliiar-about 5.0m long and 1.0m square, lying on the ground at the N end of the 'bailey'. 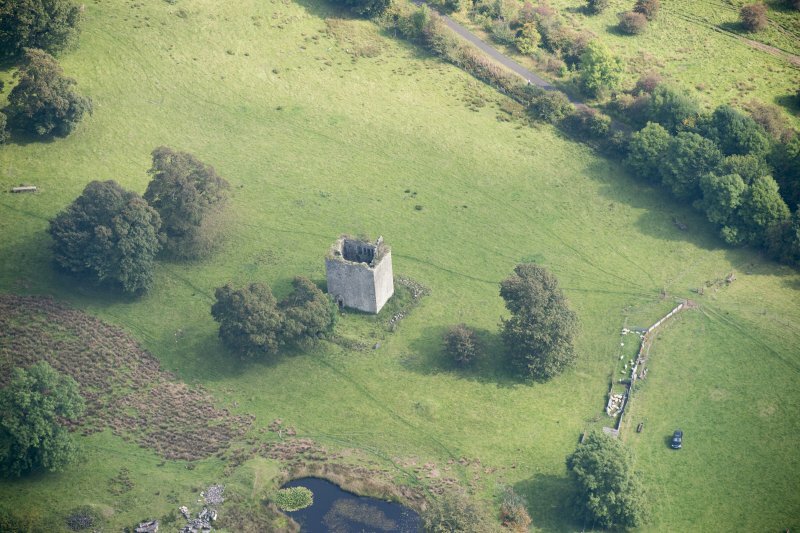 (cf Elliston Castle: NS35NE 1; Duchal Castle: NS36NW 8). 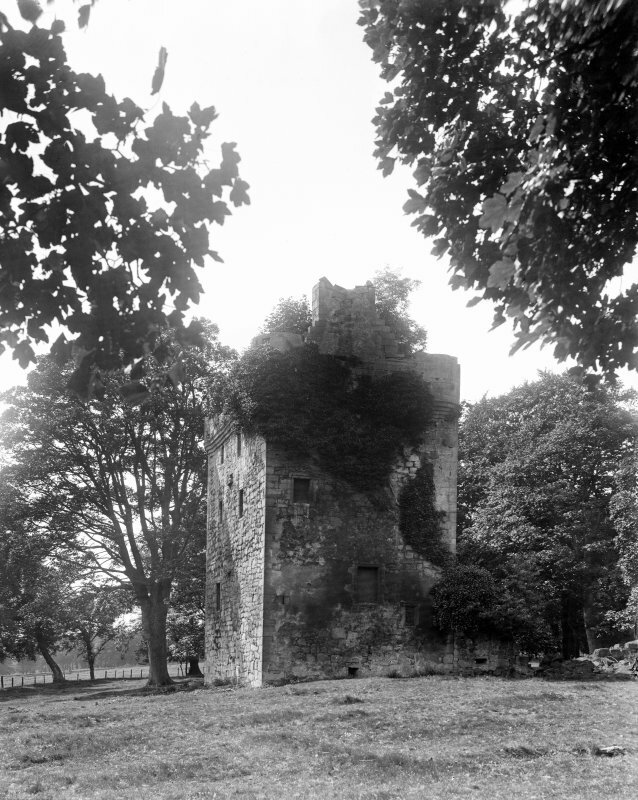 The second phase, probably in the late 17th century (see dates above), was one in which the tower was converted from defensive use into a larger residence, the provision of stone for which may explain the removal of the curtain wall. 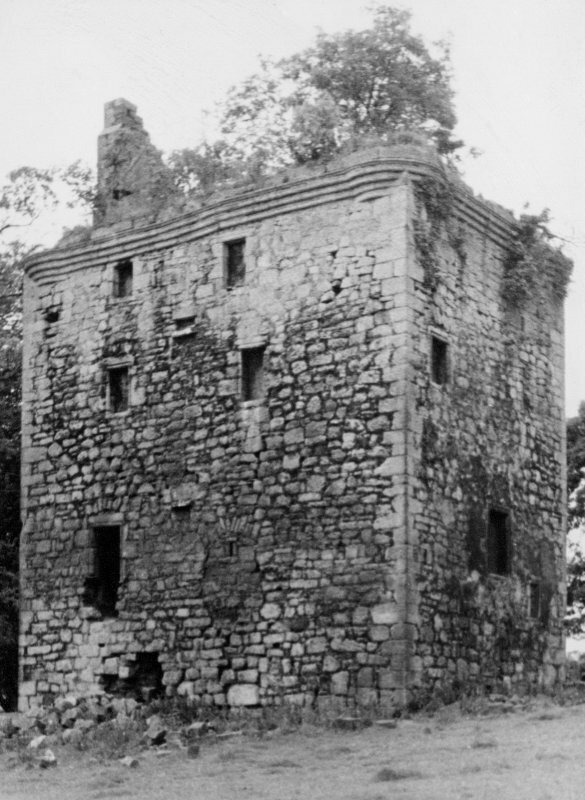 There is an extension to the tower on the W and the marks of a double eave on the S walls of the tower. 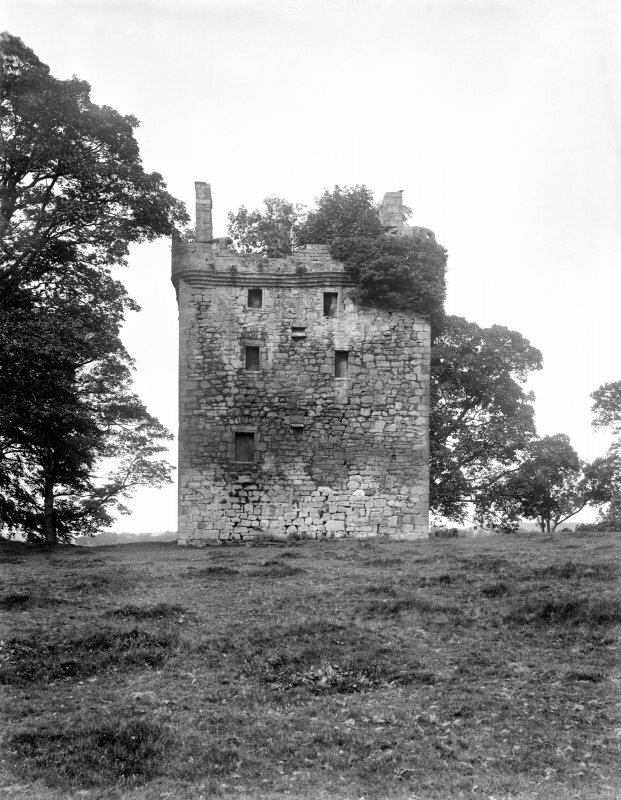 Further alterations were by the insertion of square windows and doors, a square staircase in the internal NW corner, and a later chimney. Each of these is identifiable by the different mortar and fresh stone. 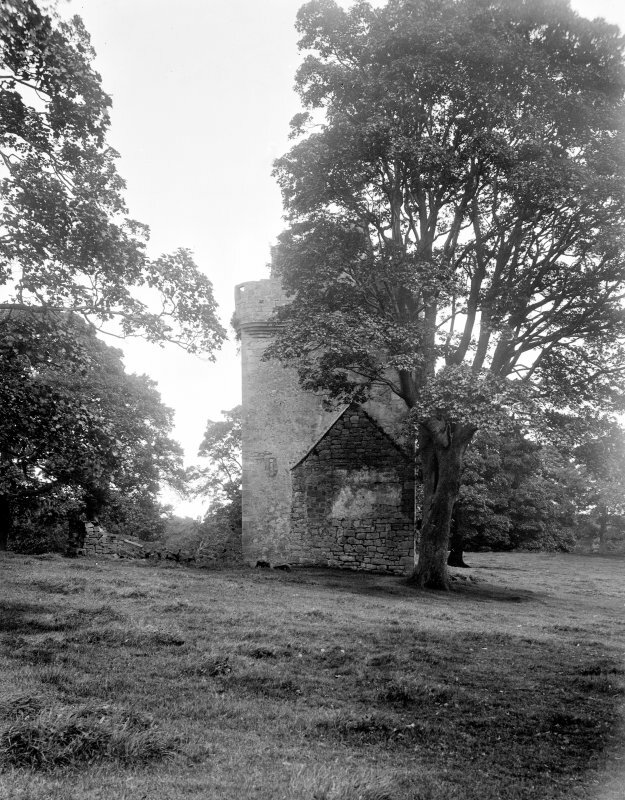 Visited by OS (WW), 24 July 1955. 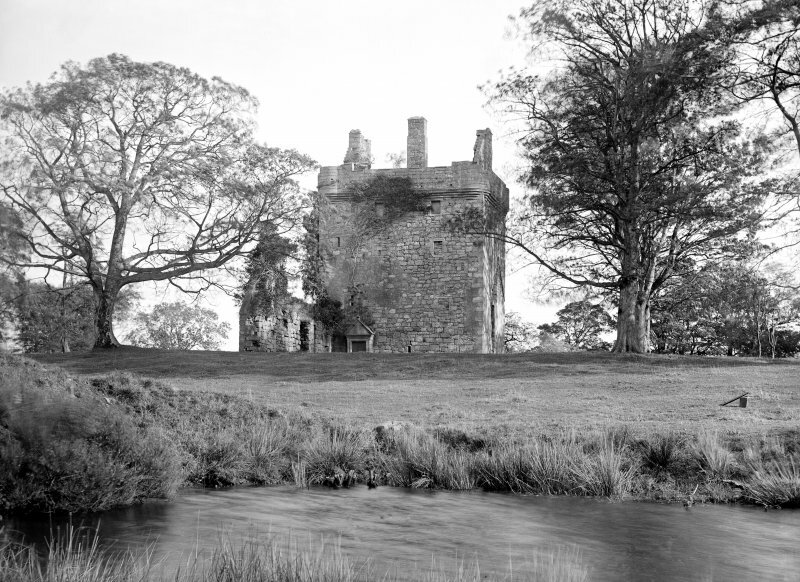 Information from Historic Scotland, scheduling document dated 11 February 2011. OS (GIS) MasterMap, March 2011.